From Dec 6-9 of this year, Japanese Facebook dating app Match Alarm quizzed 2,944 singles in their 20s and 30s about their dating habits. They were asked to identify if they prefer to date someone of the same age, older or younger. A resounding 81.3% of women replied that they would rather be with a silver fox than a younger stud. And one in three men said they preferred an older lover. Think about it. Of course, an older lover tends to have plenty more tricks (and probably money) up their sleeve, a lot more emotional maturity and maybe even a decent job, a car or an apartment. Less prone to wild accusations and intense jealousy, more prone to intense orgasms, the older lover comes with many benefits. You might find the odd youngster who knows what they want and happens to be a mature forty-year-old in a tween’s body, but these are few and far between. More commonly, the idealized younger lover will be twerking to Miley and pouting and sulking when they don’t get their way. Breaking it down by age group, more than half of 20- to 24-year-old men preferred an older lover to impress their friends with. An older lover to rope them in and show them the ropes. 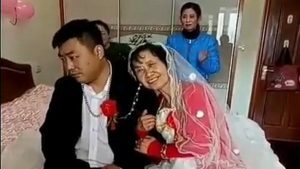 Unfortunately for them, not too many 25- to 34-year-old women returned their affection, but about one in three 35- to 39-year-old women might go for a younger-man liaison. When one Fukuoka man in his late 20s was asked why he would rather be with a mature lover, he replied, “I want someone who’ll gently comfort me when I get lonely.” Don’t we all? Hug me, squeeze me, love me! Another man from Tokyo in his early 20s said, “When I’m with [an older lover], I feel calm and secure.” Many men extolled the infinite virtues that only “the older lover” possesses. 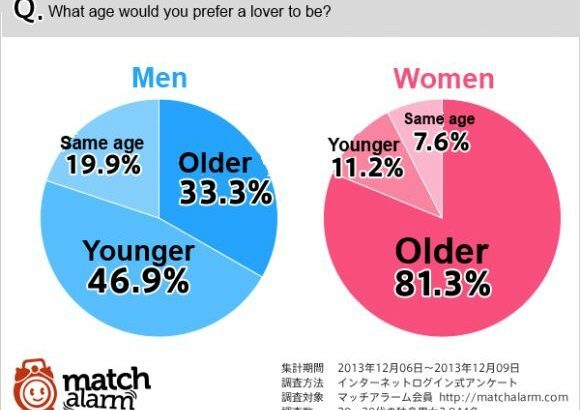 By contrast, the single women in Japan overwhelmingly preferred older men as lovers. Could it be financial security, experience, confidence, or women’s social conditioning? In successively older male and female age brackets, the popularity of older lovers seems to fall. Still, older men take hope — younger single women seem to prefer an older man at least half the time and probably more than half. On the other hand, some women do prefer a younger man. One Tokyoite in her early 20s said that younger men have a generally more forgiving nature. An Osaka woman in her early 30s commented that younger men could be trained, and were more tolerant. I guess you can’t teach an old dog new tricks, but young dogs are keen to learn. Finally, it’s worthwhile remembering that these things are highly arbitrary. I used to think I preferred older men. Why? Because I thought that if my lover was the same age as me, he’d be more likely to leave me for a younger woman at some stage down the track. Instead of suffering the pain of being replaced with a “newer model”, I thought it might be nicer to be that younger woman myself. Not that I’d ever want anyone to break up on my account, but all the same, better safe than sorry. Anyway, this was a purely hypothetical situation which never came to pass, and now I couldn’t be happier with my fresh-faced boytoy. Age is only a number, so it’s best not to attach too much importance to it. We’re all individuals, not statistics, so whoever legally floats your boat, I say go for it! Older, younger, or the same age: we can all have mutually satisfying relationships.